A truck moving in a straight line carries a box. During linear motion box does not move and has the same velocity of the truck. 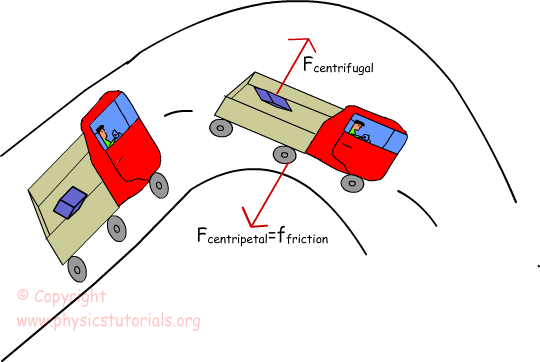 However, when the truck goes around a curve, box starts to move outward to the center of the curve as if an unknown force pulls it. We also feel this force when in a bus or car while it is doing circular motion. Is there a force pulling us outward from the center? The answer is of course NO! Let me explain this complex situation with Newton’s Laws of Motion. We have said that for having acceleration there must be an unbalanced net force on that system. Here, a friction force between the road and the tiers of the truck becomes our unbalanced net force. It changes the direction of motion and truck does circular motion. On the other hand, the friction between the box and the surface of the truck is not enough to make it does also circular motion. Because of the Newton’s First Law of Motion “Law of Inertia” box tends to move in a straight line. Thus, it slides on the truck and feels like something pulls it outward from the center. This is only inertia of the box, in real there is no centrifugal force.